A new website has been launched to allow drivers to submit dashcam footage, in the correct format, directly to the relevant police force. The National Dash Cam Safety Portal (NDSP), developed by electronics company Nextbase, has the backing of Brake and Cycling UK and covers a range of road incidents including dangerous driving, using a mobile phone and driving without due care and attention. Nextbase says the new site will reduce the time and resource police forces spend processing footage, from an average of 14 hours to just a few minutes per video. All 39 police forces in England currently have different methods of accepting video footage – varying from via social media to burning the footage onto DVD. 19 forces accept dashcam footage directly – although Nextbase anticipates the remainder will soon follow suit. Nextbase says the variety of submission methods is confusing and can result in clips being ignored and unprocessed. Cycling UK says given a reduction in roads policing resources, it’s crucial that efficient and standardised online reporting systems are introduced to facilitate the submission of dash, bike and helmet-cam footage showing irresponsible road use. 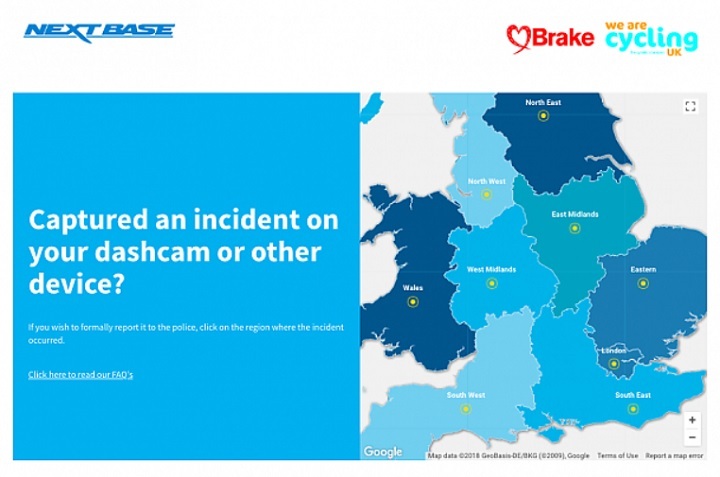 One partnership that accepts dashcam footage directly is the Safer Essex Roads Partnership (SERP), through its Extra Eyes campaign, with Essex Police announcing it received a record 289 videos during June – taking action in response to 65 of the clips. Duncan Dollimore, Cycling UK’s head of campaigns and advocacy, said: “Public cuts have led to road police numbers plummeting in recent years by nearly 50%, while casualties have increased among all road users. “The increasing popularity of dash cams is a huge positive for road safety. However, with more drivers than ever seeking to report illegal behaviour the burden on the police has increased. We already have a fully functioning one-stop-shop dashcam portal operating across Wales, thank you. Operation Snap. Very effective.